Its been over a week since Rev3 Williamsburg. I wanted to stew on my thoughts for a bit before writing my race report. Attitude is everything, and I'm sorry to say that my attitude both in the ramp up to Williamsburg and day of wasn't quite where I wanted it to be. All it all it was still a good day, and a great weekend of tri-shenanigans, but I can see a lot of room for improvement, particularly in the space between my ears. I had first breakfast of Naked Juice, Skratch Hyper Hydration, and two Uncrustables at 2am (ish) and went back to sleep. My real alarm went off around 3:30, and I got in the shower to wake myself up. Gear check, wake up J, race number tats, sunscreen....the usual race day drill. We headed out for Chickahominy River Front Park, while I snacked on second breakfast of Skratch chews and sport hydration. Missing? My usual race day buzz of excitement. I felt exhausted, and nothing sounded better than crawling back into bed. Even so, we made it to the race site, unloaded the bike, and I made my way over to transition. It turns out that because Team Z had so many people racing, we were all racked together. Cool! I didn't actually know any of my teammates racing the Sprint, but race morning is always a nice time to make new friends. I set up my transition space, and headed over to swim out to check on the 1/4 mile surface we'd be running on to T1. Smooth pavement, so I opted out of leaving shoes there. As I made it back to transition I saw Stacey, who had come out to cheer. So sweet! By this time I had already mentioned to J more than once that I wanted to go home and take a nap, and I even said to Stacey that I just didn't feel excited. My head was just not in the right place. There was a final application of sunscreen, the choosing of the goggles, and then it was time to go line up for the time trial swim start. No turning back now! Definitely one of the choppiest swims I've done to date. Sighting was pretty challenging, as there was just a stand of trees ahead, but with the waves you couldn't even see them. I just tried to stay calm and carry on. I really wanted the swim to be over....which is really unlike me. Usually the swim is my favorite. More signs of just how off I was feeling that day. Made the turn at the buoy and things calmed considerably. There was a pretty strong current that almost took me past swim exit, but I caught it and corrected in time. Swam until I hit the boat ramp with my hand, and stood up in about shin deep water....not bad! I feel like I can always push a bit harder on the swim. Then again, I've barely gotten to the pool once a week this year. I do tend to ride with my head a bit high, especially when sighting is difficult, so that's something to work on. This included the 1/4 mile walk/jog from swim exit to transition. I jogged the pavement, and walked the grass due to some uneven ground surface. Got my shoes, helmet, sunglasses, and hydration pack on. Skipped the gloves since it was supposed to be only 13.1 miles on the bike (ha!) Walked out to the mount line, and got clipped in on maybe the third try. #performanceanxiety reigns supreme with regards to clipping in. So I hit mile 6 of this course and was on the lookout for the turnaround. It didn't show up until after mile 7...the exact same point as last year! 15.3 mile course again, despite the maps claiming it was 13.1. That's irritating. On the bright side, we got to go out and back on the street, whereas last year we came back on the narrower and bumpier multi-use trail. I got passed a bunch, as usual. I did actually play leapfrog with one girl, then managed to pass her for good. Whaaaa? With my hydration pack, I took on fluid four times! Big win! I probably could have pushed a little harder, but I always say that. I'm 20 pounds heavier this year, and was roughly 5 minutes slower compared to last year. Could that be weight related? I was hoping to have a faster overall speed, since I've been riding with the team on the road a lot more this summer, and feeling more confident with my handling. My lady bits started complaining at the turnaround, as per usual on flat courses. The lack of movement starts to feel achy. I wasn't as strong as I would like up the last hill, but it wasn't a big heart pounding climb or anything. My calves had been feeling sore lately, so I chose to run in my Brooks instead of my Vivobarefoots. That means socks are required. Socks that I struggled with mightily for what felt like an eternity until I finally got them on. I was trotting up the bridge, gave up and walked the rest of the way. I ran back down, but then walked again at mile one. My calves felt like they wanted to burst....but we're all hurting at the point, aren't we? Its a mental issue, the inability to run. It really was a perfect day, not too hot, it would have been great to be able to run the whole thing. My body didn't let me down, though. I have to say that it was a bit weird running around the park before making it to the finish line. It seemed like it took forever, and you could see and hear everything for so long. But then...that final turn....I cracked my first big smile since the swim exit, and ran across the line. Woot! Upon stopping my left hand immediately went numb, though the feeling came back after about 10 minutes. I didn't feel super dizzy or weak. J gave me a salt tab immediately, and then I sucked down a bottle of Skratch Wellness over the next 20 minutes or so. I chatted with my friends who were there cheering, and despite standing still, never felt like I was going to pass out. Winning! I did have an issue where I registered with my maiden name, and then emailed and asked them to change it to my married name. They said they did. I saw the bib list with my maiden name, asked them again to change it, they said they did. Didn't happen. Not a huge deal, and honestly it is my first experience that was less than positive with Rev3. Rev3 puts on a good show, and I always look forward to Williamsburg. This is my second year doing the sprint, and I certainly see myself coming back next year for either the sprint or one of the other distances. That's 2 out of 3 then. I swam calm and smart, even with the chop. And standing up in shin-deep water? Definitely swam that in as far as possible! Hydrating on the bike was a big win. I'm really glad Coach Ed convinced me to shelve the ego and get a hydration pack. Total game changer to be able to work on confidence and handling but still be able to drink on the go. Run? Not like I wanted to. I had a stronger run in me, and my attitude held me back. On to O.W.L. time goals. Well, those were based on the course maps, which said the bike course was 13.1 miles. 15.3 miles may not sound like a lot more, but at my speed it amounts to a difference of 9 minutes. My 2:18:42 would have been 2:09 if the bike course had been as advertised. So that earns me a grade of Acceptable. I think? I haven't actually accounted for rounding in my goals. Let's call it A for Acceptable! I wrote this about five days ago, and it sat in my drafts until now. Reading through this post now, clearly my mental game is where I need to focus. Why so much negativity? This has been a really tough year, and I finished the race feeling strong....why am I not overjoyed? So there we go...ending on a bit of a sour note, I guess. But hey, that's where I'm at right now. Big thanks to everyone who came out to cheer, especially friends who were racing the following day. That's an early wake up call for sure, and it was so appreciated. Special thank you to Stacey, whose smiling face as I exited that swim was much needed, and set me up to shake it off and move forward. Swim Fest was amazing, and I absolutely recommend it. Since it wasn't really a race, more a training day, let's get the goal stuff out of the way first, shall we? yes, you did have to run out of the water between loops. Yes, it sucked. My official finishing time for the 2250m swim was 1:02:23. Rounding down, that gives me a grade of Acceptable. For someone who has scarcely swum once a week since April, and even less over the fall and winter, Acceptable is exactly what I deserve. What I'm actually most proud of it how I paced myself. The course is three loops, and I had each loop within 90 second of each other! My other goals were to be calm and have fun, and I nailed both of those, too. I plunged right in, zero anxiety, and just swam. As for the fun...yes, totally. A day with friends, a swim, and a burger. Basically a dream day, no? Liz picked me up at o'dark-thirty, picked up Emily at o'dark-forty-five, and then we were off for Luray. Having the sun come up behind us was neat, and seeing the mist roll over Shenandoah is always beautiful. Once we got to the race site, we set up our home base on the top of a hill, with a great view of the lake. 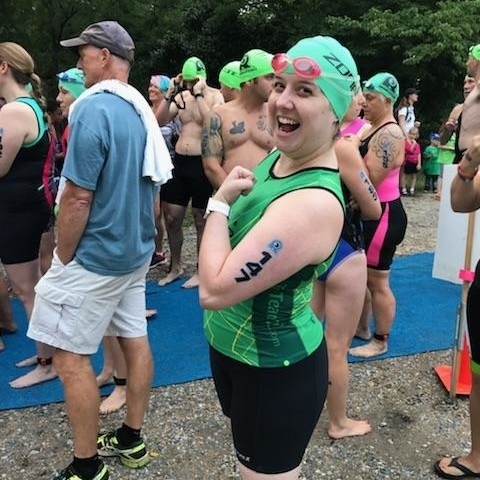 Emily had never swum open water before, and was signed up for the 750m, and Liz was signed up for all 3 distances, so they were first in the water. Since the 2250m didn't start for a few hours, I wandered over to the Team Z tent for a little bit, said hi to Caroline, and then wandered around a little more. I practiced some pre-race nutrition, just to make sure everything was going to sit well. I started getting some nasty burps about midway through my swim, but I think that has more to do with me swallowing air than my nutrition. I had the breakfast of champions (Pop Tarts) as we headed out of Northern Virginia, a pouch of Skratch chews and a bottle of the Sport Hydration about 90 minutes before, and a VFuel gel with some more water right as we were heading in. Way too many calories for a typical one hour swim, but this was more about testing, and i'm pleased with how it went. I've tested similar before long bike rides, and I'm feeling really confident about how my stomach will handle this amount of calories at these intervals for Williamsburg. Oh! And I had my Skratch Hyper Hydration first thing in the morning, and the Wellness as we were riding back home. This combo is quickly becoming my "must do" before outdoor events. Obviously its a huge amount of sodium, so unless you're like me and have had this much stipulated by a doctor, I don't recommend it. I'm not a Skratch ambassador or anything, although I'm starting to think I should apply to be. I've simply found that the products sit well in my stomach, and have the necessary sodium for me to manage my POTS symptoms. This event is fantastic for beginners, I have to say. There are tons of SUPs and kayaks, and because it is a loop course, you're never really far from shore. Far being a relative term, of course. Swag for the race included a medal and a super soft race shirt. I am loving the trend of my most recent races having these soft shirts. They get so much more use than the stiffer ones. You could also pay to upgrade to a big beach towel if you wanted, which came in loads of colors.